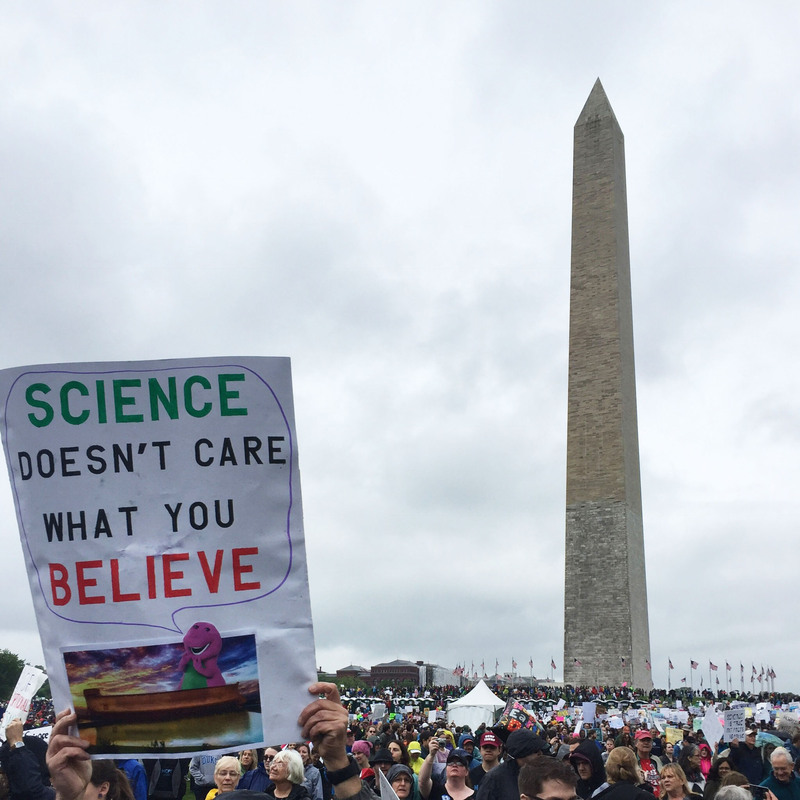 Marching for science also meant marching for a more inclusive society. Ella Clarke (second from left) at the March for Science in Washington, D.C.
As scientists and their supporters marched down Constitution Avenue toward Capitol Hill, between chants of, “ho ho, hey hey, don’t defund the EPA,” I was able to chat with fellow protestors about why they were marching and staying engaged after nearly 100 days of an administration that values corporate interests over scientific facts. 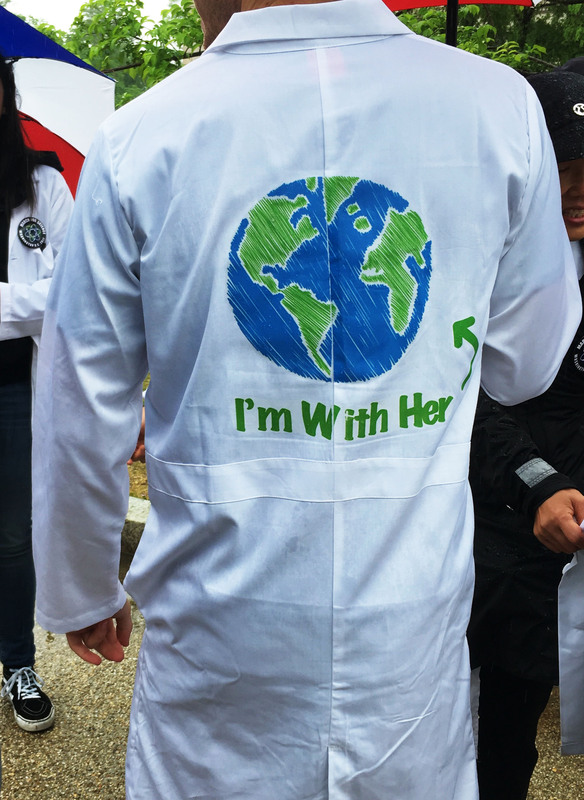 A participant in the March for Science shows off his costume. 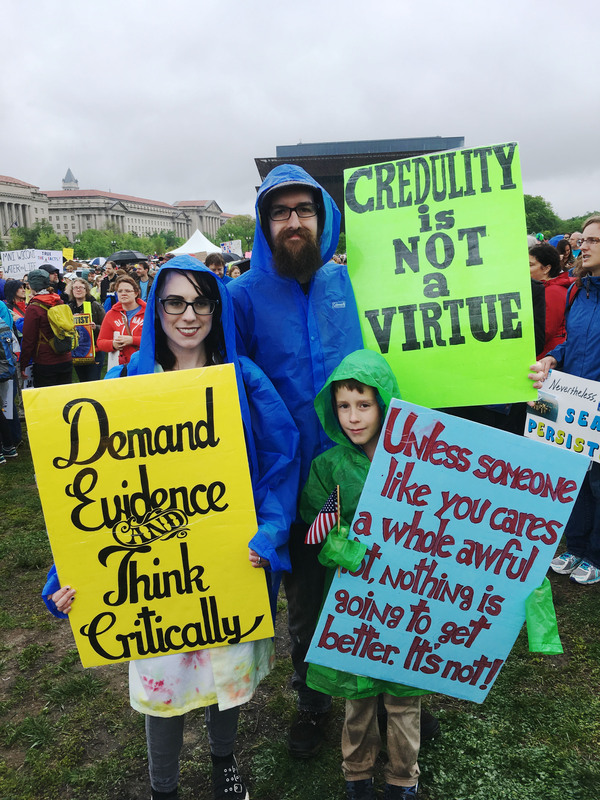 As we continued through the intermittent rain, I felt both lucky to live in a country where people from diverse backgrounds are able to engage in this kind of open protest, and disillusioned that in 2017 we have to march for science at all. Research that helps protect clean air and water, cure diseases and ensure our food is safe to eat should not be something we have to fight for. People like Shirazi should be able to focus on advancing medical science, not figuring out how to pay their tuition. A family of activists display their signs. Scientific research provides the data critical to the fight for clean air and clean water for every local community, regardless of belief system, socioeconomic status or race. It allows regulators and advocates to do things like measure fenceline air quality, calculate lead levels in drinking water and create solutions to mitigate climate change to protect future generations. Defunding agencies like the EPA and devaluing the contributions to science made by people from all walks of life will disproportionately affect low-income communities and communities of color that already live with the majority of pollution and adverse health effects caused by industry. 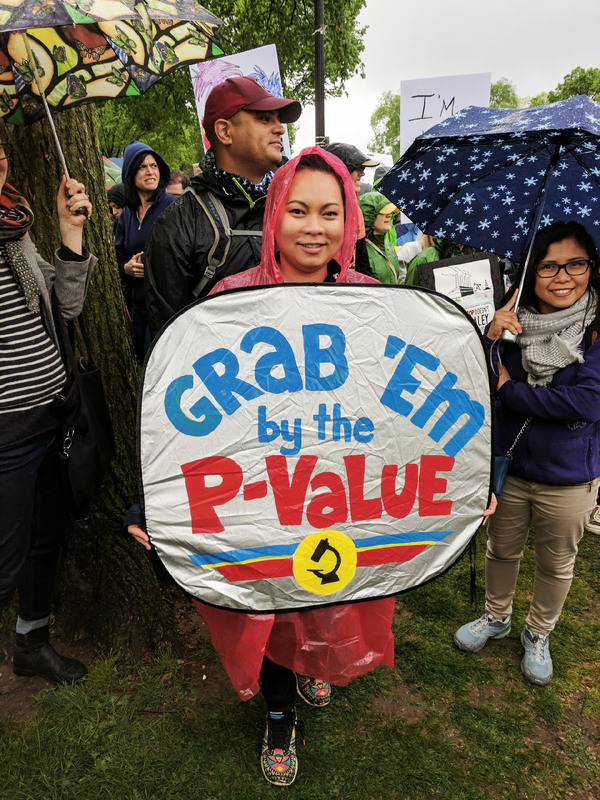 A participant in the March for Science shows off her sign. At Earthjustice, we will continue to fight alongside these communities and achieve major victories for environmental justice. Together, we pushed the EPA to update lax Worker Protection Standard for farmworkers, helped convince Oakland, California, to ban coal trains that would have impacted communities of color and are suing to stop a crude-by-rail operation in Albany, New York, that is putting a low-income African-American community in danger. Many people have asked me what more they could do to help advocate for science and the environment after the March for Science. Our voices are stronger together. Please join with us and our partners in taking action against political attacks on the clean air, clean water and healthy food we all depend on. Marchers converge on the National Mall in Washington, D.C.
Ella is part of the donor engagement team in San Francisco, California.